According to the Whiting Saturday Sun, “The first clothing firm in Whiting was that of Migatz & Stiglitz, which opened in 1901. 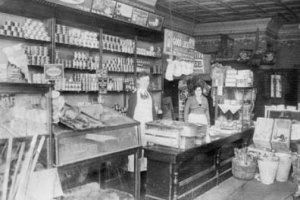 They were an immediate success and later added a large dry goods department to their establishment.” Mr. S. Recht was one of the last few retailers to leave the old retail district that resided across the tracks. He opened his new shop in a new building at the corner of Clark and 119th Street. Likewise, Mr. Harry Gordon built up a large dry goods business. He was a persistent advertiser whose business was ideally located across the street from the original post office. 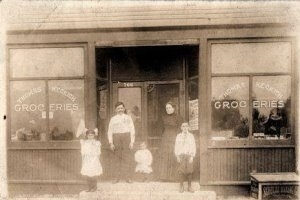 Two well known names in groceries and meats were James Allison and the Fischrupp Brothers. Their businessess saw immedate success. Both Mr. L.H. Mattern and Dr. Kohr made successful careers in the pharmaceutical business. The Davidson brothers are notable individuals for establishing the oldest real estate firm in the city. 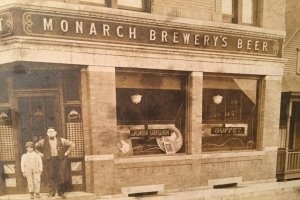 They opened their office in 1891 during the flush times of the first boom. 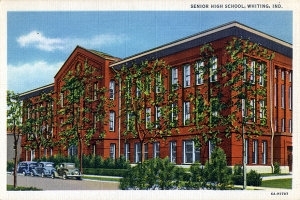 Smith and Bader later became well known names in the real estate game, as they handled the Central Park Addition to the City of Whiting. The 1907 Whiting Saturday Sun says that, “Whiting occupies a peculiar and enviable position in the banking field in Lake County. 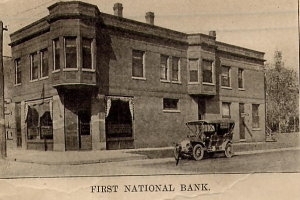 Although the banks of Whiting are new, they have been ably conducted, and have great strength.” In 1907, Whiting had men at the head of six banks in Whiting, one in East Chicago, one in Indiana Harbor, and one in Tolleston. 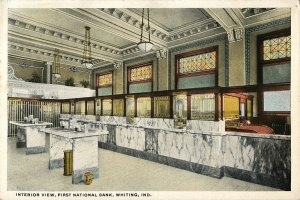 The first bank established here was the Bank of Whiting owned by the Schrage Family. If a child graduated from eighth grade in 1896 they had to attend a High School in a neighboring town. But, in 1898, it was decided that eight pupils attending the neighboring schools were sufficient enough to start a local high school. The first superintendent was Mrs. Florence B. Homman, who had previously been a principal and grade school teacher. 1901 had a graduating class of only three members and the year following there was but one graduate. 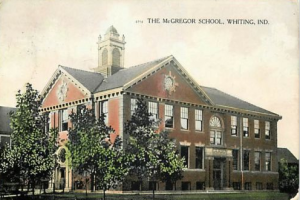 By 1927, Whiting had five schools within its public school system. 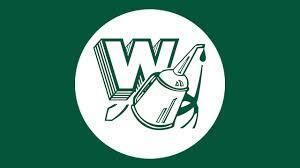 Superintendent Holliday is quoted as saying, “Whiting was among the first of the schools in the Calumet region to make manual training and domestic art a part of the course of study. There is little doubt that manual training has kept many boys in school.” In 1923 a new Junior High School building, which adjoined the McGregor building, the primary building, the old auditorium, and the high school on Oliver Street, was completed. The cost of this building was $450,000. 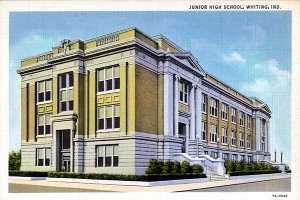 According to the 1924 Reflector, “It (Junior High School Building) was equipped with a large gymnasium, swimming pool, and large auditorium with a well appointed stage, in addition to the class rooms. In addition to these school buildings, a handsome grade building has been erected in Wilcox, a subdivision in the south part of the city. It is a very modern structure with eight class rooms, a large auditorium, and ample playground space.” Today, the School City of Whiting consists of a primary building, a middle school, and the high school. In 1994 a brand new athletic-administration complex was dedicated. The site consists of a football field, softball diamond, administration offices, and two classrooms, one for children in kindergarten and one for preschool students. 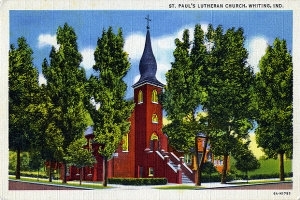 The St. John Evangelical Lutheran Church was the first religious organization established in the city of Whiting. Formed in 1866, the first meeting place was in the home of Robert Klose. On the night of June 26, 1890, nine people met in Dr. Holman’s hotel to discuss the establishment of a church for their small German settlement that was slowly becoming a boomtown. These nine men established the Plymouth Congregational Church, one of the first Protestant churches in the city. In the same year, Rev. Joseph Kroll was sent to a settlement surrounding the Standard Oil works for the purpose of selecting a suitable site for a Catholic Church. In a room over a saloon on 119th St., Father Byrne celebrated Sacred Heart’s first mass. Eight years later Sacred Heart moved to LaPorte Ave., where it now resides. A school house, convent, and rectory were later built. 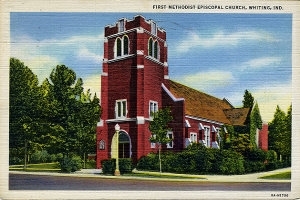 Methodism was organized in Whiting in 1891. It grew out of a Sunday School which was meeting out of a room in the High School. 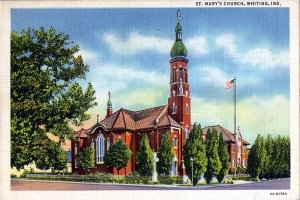 In 1897, St. John the Baptist Church and School was dedicated to accommodate the overpopulation of Catholics at Sacred Heart.